FILE - Military police clear a barricade set up by protesters supporting opposition presidential candidate Salvador Nasralla, in the outskirts of Tegucigalpa, Honduras, Dec. 22, 2017. Honduras' leftwing opposition Tuesday called for a month of protests and possible insurrection to reject President Juan Orlando Hernandez's claim to have won re-election in a bitterly disputed poll held in November. The declaration comes ahead of Hernandez being sworn into a new term on January 27. The opposition has denounced the November 26 runoff election between Hernandez and its candidate, Salvador Nasralla, as rigged. Foreign observers said they noted irregularities in the vote. After the election, opposition protests took place, countered by robust police and military contingents. At least 31 people were killed, according to the government's National Commission on Human Rights. FILE - Honduran presidential candidate Salvador Nasralla holds a press conference in Tegucigalpa, Honduras, Dec. 22, 2017. The United States last month said it recognized the victory of Hernandez. The 49-year-old conservative has Washington's backing for his policies aimed at stemming undocumented migration of his citizens to America. 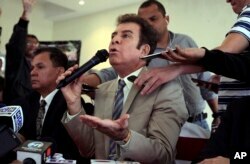 Nasralla, a 64-year-old popular former TV president, initially conceded after the U.S. declared its support for Hernandez. But he then came back with the Opposition Alliance Against the Dictatorship to demand the election results be annulled. "We have a strategy that we are going to develop in this month of January," Nasralla told a news conference in Tegucigalpa. He said it would involve "protest actions" including a march on Saturday in the country's second-biggest city of San Pedro Sula. The opposition's chief coordinator, former president Manuel Zelaya, told the news conference that the outcome of the November election was that "the president is Nasralla." "Nobody should obey a usurper government," he said.